Yesterday, in a 7 -2 decision the U.S. Supreme Court ruled in favor of the Trump administration travel ban by residents of six mostly Muslim countries. This is a huge victory for Trump, the rule of law and the safety of American citizens. This is a tremendous loss for Democrats and liberals who have no want or need to protect its citizens from outside hostile individuals. So much for all of the liberals who said Trump could not do such things like protect the United States of America. Although the decision is not final, it means that the ban can go into place while the cases are heard. With a 7-2 decision, it is most likely the ban will be upheld when the case is finally heard. The ban applies to travelers from Chad, Iran, Libya, Somalia, Syria and Yemen. The Supreme Court on Monday allowed the Trump administration to fully enforce a ban on travel to the United States by residents of six mostly Muslim countries. It would appear that President Donald Trump and his temporary travel ban is looking to make America safe again. As reported at Town Hall, the FBI is currently investigating 300 refugees that have been admitted into the United States for ties to terrorism. This is after so-called vetting procedures failed and thus allowing them in America in the first place. REALLY? Also reported is that many of these refugees come from countries that are listed on President Donald Trump’s executtive order, temporarily banning travel from in order to review the vetting process. Nearly a third of the 1,000 FBI domestic terrorism cases – 300 – involve those admitted to the U.S. as refugees, a Department of Homeland Security official said Monday. Officials said some of those 300 came to “infiltrate” the U.S., while others were radicalized once they were in the country. Monday’s development marked the first official concrete linkage between the refugee program and terrorism. During a speech to the National Association of Attorneys General in 2015, FBI Director James Comey said agents were working on nearly 1000 ISIS linked cases throughout the United States. Secretary of Homeland Security John Kelly said the travel ban announced Monday was a key to ansuring the refugee program is conducted safely. Several refugees have already participated in mass attacks in recent years motivated by apparent Islamic radicalism. Somali refugee Abdul Razak Ali Artan rammed his car into a crowd at The Ohio State University in November after posting a message on Facebook warning America not to interfere with Muslim communities. Somali refugee Dahir Adan reportedly yelled “Allahu Akbar” and asked one victim if they were Muslim during a September rampage in which he stabbed and injured nine people at a Minnesota mall. Seddique Mateen, the father of Pulse nightclub shooter Omar Mateen, is an Afghan refugee. Countless other refugees have been convicted of plotting attacks or planning to join ISIS abroad. Though they didn’t enter the nation as refugees, several other terrorists have benefited from inadequate vetting to come to the U.S.
Tashfeen Malik, who was born in Pakistan, came to the U.S. on a K-1 “fiancée” visa prior to engaging in a deadly shooting spree with husband Syed Rizwan Farook that killed 14 and injured 22 others in December 2015. Dzhokhar and Tamerlan Tsarnaev, the brothers who orchestrated the 2013 Boston Marathon bombing, were born in Kyrgyzstan and entered the U.S. when their family filed for asylum. Today, the U.S. Senate has confirmed retired Marine Gen. John Kelly as President Donald Trump’s Secretary of Homeland Security. Another fantastic choice and a great addition to the Trump cabinet. The Senate voted 88-11 to confirm Kelly to lead the Department of Homeland Security. 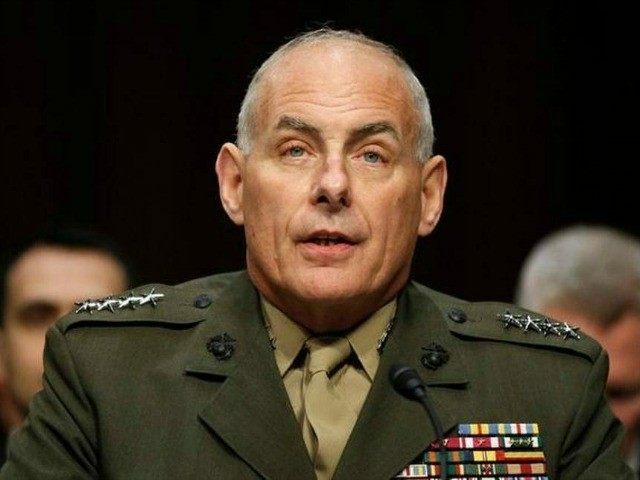 Retired Marine Gen. John Kelly was confirmed as Donald Trump’s secretary of homeland security on Friday evening, soon after the inauguration of the new president. The Senate voted 88-11 to confirm Kelly to lead the Department of Homeland Security, an agency formed after the September 11, 2001, terror attacks. Kelly faced little resistance during his confirmation hearing before the Senate Committee on Homeland Security and Governmental Affairs last week, during which he faced questions about Trump’s plan to build a wall on the southern border, immigration, cyber security, the drug trade, and homegrown terrorism. Kelly was commended by Republicans and Democrats as a formidable choice for the job given his experience commanding the U.S. Southern Command. 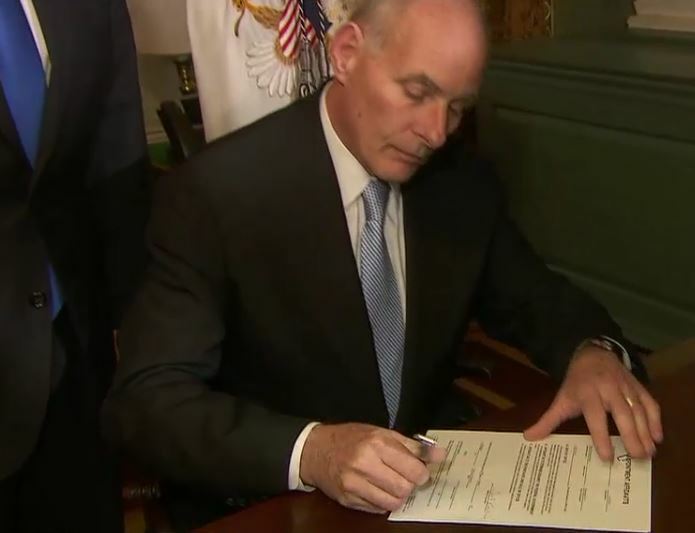 UPDATE I: Retired Marine Gen. John Kelly sworn in as Secretary of the Department of Homeland Security.